When both Russian and German war veterans boo the epic movie Enemy at the Gates (2001) on the Battle of Stalingrad between 22 August 1942 to 2 February 1943, director Jean-Jacques Annaud must have done something right, as the saying goes. The opening scenes of the film do bring to mind the famously rough scene in Saving Private Ryan (1998) depicting in graphic detail the Omaha Beach assault on June 6, 1944. But director Steven Spielberg was awarded with military honours and medals for telling it as it without demonising the Germans. In contrast, Jean-Jacques Annaud has been accused of severe historical inaccuracies and unfairness towards both Soviet and German fighters and officers. Therefore I did not and could not believe the first battle scene in Enemy at the Gates and said to myself "it cannot be". The way Soviet soldiers are taken to the front in locked train wagons, forced by gunpoint to boats to cross Volga with petty officers eventually shooting with their pistols those who jump to water to escape a deadly Stuka squadron attack is already too much for me to believe. After all, these are Russian officers and Russian men, how could this be? But the real horror is in the depiction of the attack these shell-shocked men were taken straight from the boats to shout uraa and to run over an open town square against well-defended German position on the other side of it. The crazy attack is carried on by untrained men who have just arrived from a cruelling trip and who have been handed either a rifle or some bullets. The Wehrmacht, on its side, had provided soldiers with strong helmets and they have machine guns in addition to military rifles. Even some tanks are nearby to support the well protected line of highly trained German soldiers working in unison like a well-oiled machine. Such a total waist of human lives, such stupidity by the commanding officers, such a lack of coordination, training and elementary military skills can surely not be! Mister Annaud surely has invented these things in the movie - they cannot possibly be based on what actually happened in Stalingrad. It bugged me so I just had to go and check the facts - never mind the duel between the two sharpshooters or the love story or the tragedy of the little boy - just to see how far from the truth Enemy at the Gates depiction of the battle must be. And I was even more shocked after learning that probably it was exactly as Mister Annaud tells it, possibly even worse. 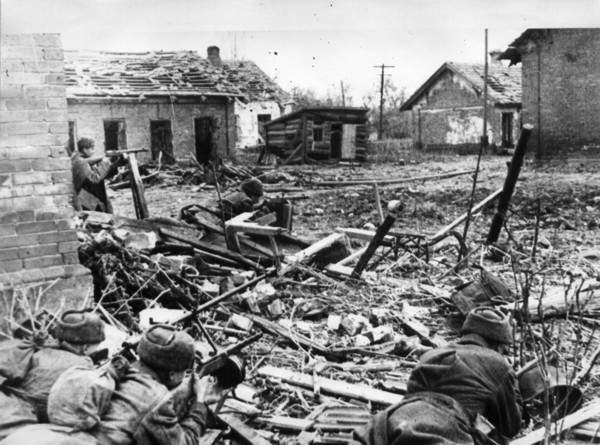 The Red Army sent thousands of men in Stalingrad to certain death in futile attacks against far superior German positions and executed those who tried to retreat or escape. Various scholars have estimated the Axis suffered from 500,000 to 850,000 casualties (killed, wounded, captured) among all branches of the German armed forces and its allies, many of them POWs who died in Soviet captivity between 1943 and 1955. The Soviet authorities executed approximately 13,500 Soviet soldiers during the battle, equivalent to almost two rifle divisions. Also, anywhere from 25,000 to 40,000 Soviet civilians died in Stalingrad and its suburbs during a single week of aerial bombing by Luftflotte 4 as the German 4th Panzer and 6th Armies approached the city; the total number of civilians killed in the regions outside the city is unknown. The city was utterly destroyed. Today, Volgograd is a vibrant modern city celebrated as the place where Hitler's unstoppable attack on mother Russia was stopped.